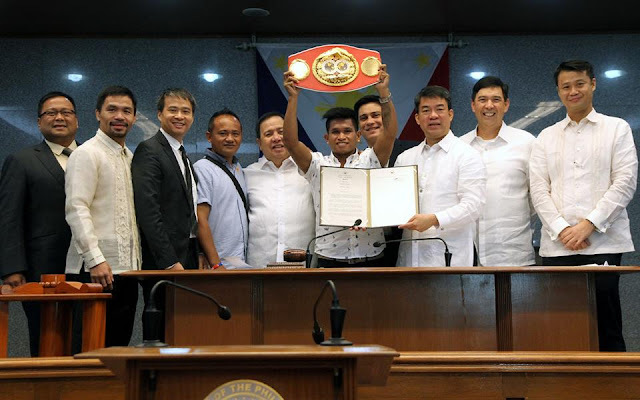 Senate proudly gives a compliment to the IBF flyweight champion Johnriel Casimero of Ormoc City, Leyte, Philippines. SENATE COMMENDS BOXER: Senate President Koko Pimentel (3rd from right) presents Senate Resolution 139 commending Filipino boxer Johnriel Casimero (5th from right) for successfully defending his International Boxing Federation flyweight title with a 10th round technical knockout over British boxer Charlie Edwards at the O2 arena in London, England, on September 11, 2016. Also in photo are (from left), Senators JV Ejercito, Manny Pacquiao, Joel Villanueva, Richard Gordon, Migz Zubiri, Ralph Recto and Sherwin Gatchalian. Casimero was accompanied by his trainer, Jhun Agrabio (4th from left). (PRIB Photo by Cesar Tomambo/21 September 2016). - from Senate of the Philippines Facebook Page. Casimero is a former IBF World light flyweight champion and the current IBF Flyweight Champion. Casimero is a world title contender since 2008. He won also some regional title and the interim WBO World light flyweight title in 2009.